Pakistanis have long suffered from internet shutdowns. At last, their voices are being heard. The photo in the image is by cesarastudillo under a Creative Commons Attribution 2.0 license. Pakistan’s government has imposed more internet shutdowns than almost any other country. It has ordered shutdowns during large events, clearly operating under the harmful misconception that shutdowns increase rather than decrease safety. Worse, the government has kept millions in the under-served FATA region in a complete internet blackout since 2016. But the people of Pakistan have not been complacent in the face of this abuse. 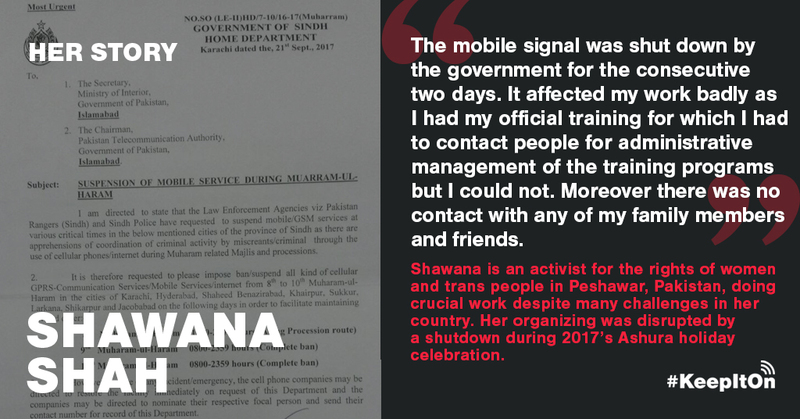 Rights advocates filed a lawsuit, and yesterday the Islamabad High Court ruled that shutting down mobile networks is illegal under most circumstances. Access Now welcomes this ruling, which is critically important for ensuring the fundamental right to free expression online. This victory is a testament to the hard work by civil society groups in Pakistan, including Bytes For All Pakistan — part of the global #KeepItOn coalition — which wrote a 2015 report that provided the court with evidence of the harm that shutdowns cause. It is pioneering research that helped the petitioners to file a case with strong arguments and create an impact. This decision is not only a boon for human rights in Pakistan. It can also bolster efforts to stop shutdowns elsewhere. An important lesson from the ruling is that documentation and research into the impact of internet shutdowns matters. Projects like Killswitch in Pakistan matter. Civil society initiatives like these are not futile. They are absolutely necessary and can make real-world change happen. Below we present some of the personal stories of internet shutdowns that Bytes for All Pakistan collected in partnership with Access Now. By sharing these stories — which add to the evidence that was presented to the court — we hope to inspire people and organizations across the globe to follow in the footsteps of Bytes for All Pakistan and other #KeepItOn members. Together, we can show courts around the world how shutdowns are affecting our human rights, our lives, and our livelihoods, and they can help put an end to this disproportionate, damaging, and pernicious practice. If you have experienced a shutdown, please feel free to use and share our multilingual web form. The photo in the image showed a Pakistani government order for a routine holiday shutdown, similar to the one which disrupted Shawana Shah’s work. The photo was obtained by Bytes for All Pakistan. There have also been shutdowns during other important events, such as Eids, Prophet’s Birthday. As we recently emphasized in a letter to the United Nations, shutdowns are deeply detrimental to efficacy and safety of journalists. Sahrish Khokher told us about her story. 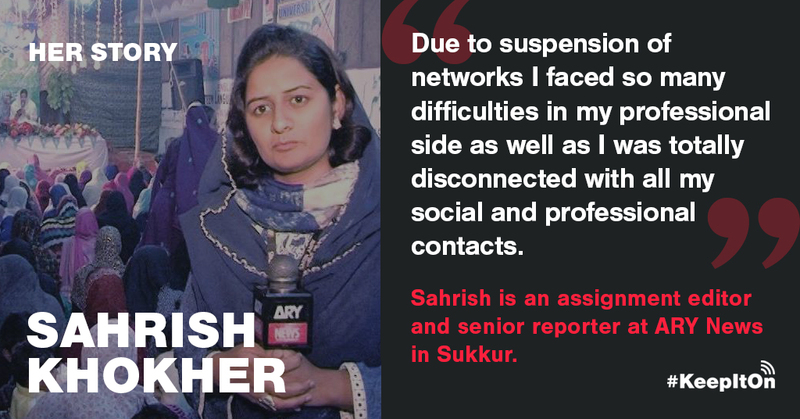 Sahrish Khokher reporting the news. Everyone deserves quality medical care and has the rights to organize politically and share news. 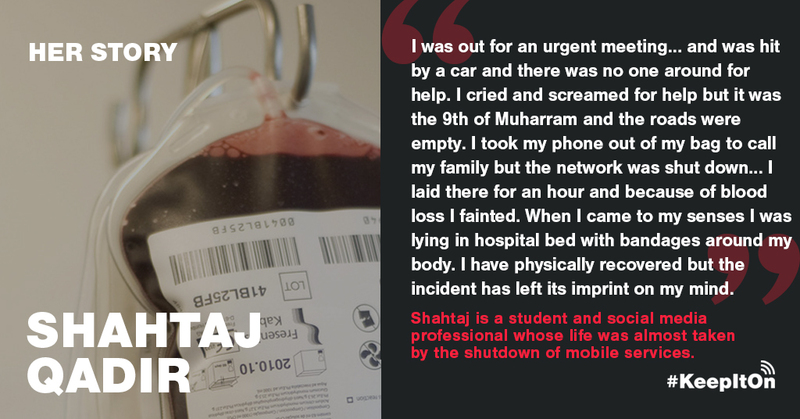 Internet shutdowns threaten each of these activities around the world: their incidence is increasing globally, and people like Shahtaj, Shawana, and Sahrish are the victims. This week’s court victory is a reminder that suffering like this should never be tolerated. Change is possible when people have the courage to tell their stories. The harm documented in these accounts underscores the importance of work against internet shutdowns by #KeepItOn Coalition member organizations Digital Rights Foundation Pakistan, Internet Policy Observatory Pakistan, and Bolo Bhi, as well as international groups like the Institute for Human Rights and Business. We invite you and your organization to join us. Become part of the #KeepItOn coalition today. We welcome submissions of personal stories through our web form (available in multiple languages), or via email to melody@accessnow.org (PGP public key: 2869 76FD FDE8 AD96 A461 F05F D6FD 9F01 FF9D 6041). We encourage bloggers, human rights defenders, activists, and others fighting shutdowns to tell their stories as well. The #KeepitOn campaign consists of 158 organizations from 65 countries that are devoted to fighting internet shutdowns. Since we launched the campaign at RightsCon Silicon Valley in 2016, we’ve seen major victories: the U.N. Human Rights Council condemned internet shutdowns; 30 governments of the Freedom Online Coalition spoke out against shutdowns, as have the GSMA, the Global Network Initiative, and the African Commission on Human and Peoples’ Rights. And, together with local activists, we have helped to end major internet shutdowns in Cameroon and Gambia.